Florin Andone in action for Brighton against Bournemouth. Picture by PW Sporting Photograpy. Goals from Dan Gosling, Ryan Fraser, David Brooks, Callum Wilson, and Junior Stanislas consigned the Seagulls to their biggest ever loss in the Premier League, and left Albion looking nervously over their shoulder at the drop zone. Hughton made two changes to the side that fought so valiantly in Albion's FA Cup semi-final defeat against Manchester City last Saturday. Florin Andone came in for topscorer Glenn Murray while Jurgen Locadia replaced Alireza Jahanbakhsh. Eddie Howe also made two changes following Bournemouth's 3-1 home defeat to Burnley in the Premier League last weekend. Skipper Steve Cook made his first appearance for the Cherries since February 9, following a groin injury, replacing Liverpool loanee Nathaniel Clyne. There was also a change of keepers as Artur Boruc returned between the sticks in place of Asmir Begovic. Brighton had their first sight of goal on two minutes but Yves Bissouma skewed his 20-yard attempt well wide of the goal. Two minutes later and a quick Bournemouth counter saw Fraser, out on the right flank, flash a devilish ball into the Seagulls box. The cross found the unmarked Josh King at the back post but the Norwegian failed to convert. On 15 minutes, good wing-play from Fraser saw the Scot lay the ball into the path of the onrushing Nathan Ake. The Dutchman's goalmouth cross met the head of King but the forward's header sailed past the post. Albion began to turn the screw as Martin Montoya whipped in a succession of crosses into the area which forced the Cherries backline into action. Anthony Knockaert and Davy Propper then played testing balls into the box which were inches away from finding a blue and white shirt. After all Albion's pressure, it was Bournemouth who took the lead on 33 minutes. A neat passing move from the visitors saw Gosling play a lovely one-two in the area with Wilson. Receiving the ball back from the forward, the former Newcastle midfielder slotted the ball low into the corner to put the Cherries a goal to the good. The visitors were now in the ascendancy and three minutes before the break former Seagull Cook lashed a long-range shot straight at Mat Ryan . As Kevin Friend blew for half-time, a chorus of boos filled the Amex as the Albion fan expressed their displeasure at a poor first 45 minutes from Brighton. The opening of the second period saw thins go from bad to worse for Albion. Ten minutes into the half and Fraser's lobbed attempt from outside the box, from a Wilson pass, flew past Ryan to double the Cherries lead. King then curled an effort just wide of the far post on 62 minutes. 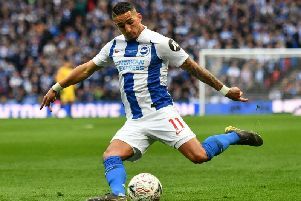 To compound Brighton's misery, Knockaert was shown a straight red for a foul on Adam Smith four minutes later after a late tackle. Bournemouth made it three after Brooks received the ball off Fraser inside the box, to finish calmly on 73 minutes. The Cherries burst forward again with Brooks, who teed up sub Stanislas to make it five at the death. Brighton & Hove Albion: Ryan, Montoya, Duffy, Dunk, Bernardo, Propperv, (Izquierdo 63), Stephens, Bissouma, Knockaert, Andone (Murray 58), Locadia. Unused: Button, Burn, Bong, Kayal, Jahanbakhsh. Bournemouth: Boruc, Mepham, Cook (Simpson 87), Ake, Smith, Gosling, Brooks, Lerma, Fraser, Wilson (Stanislas 84), King (Solanke 75). Unused: Begovic, Mousset, Ibe, Clyne.